Why do girls want to be cheerleaders (Aside from being the recipient of extra attention and popularity)? They do it for the chance to increase their interaction with athletic guys who excel in sports. I guess there’s something attractive about seeing really big, muscular, good-looking man demonstrate their skills. I wondered how long it would take while writing this article for me to feel emasculated and like a total tool. I’ve reached that point, but I’ll continue anyways since we all have bosses. Let’s break it down by each level of sports. The cheerleader-jock relationship is probably strongest during this period of life. Through pasta nights, pep rallies, parties and lunch-table politics, cheerleaders and athletes are matched up starting first period and going all the way late in Saturday night – maybe even a carryover into Sunday morning. Girls love wearing their guy’s jersey on game day, and you don’t want to be that guy that has no jersey to give. In high school, the girl would rather wear the jersey than the skater’s beanie. Just think about it this way: Is the girl going for the guy that she and all her friends can go to watch play on Friday night or the guy sitting three rows down from her watching you play as well. Also, it doesn’t hurt that dating a star athlete in high school helps girls gain something they far too prominently value: popularity. When considering college in this debate, the focus moves away from the pursuit of popularity and towards the inherit attractiveness of the idea of dating an athlete. College athletes aren’t jocks; they are minor celebrities. As a result, terms like jersey-chasers are born. These individuals blindly follow the jersey similar to how a group of animals flock to the watering hole. The star college athlete doesn’t need game. He can chill in the back of a bar (a bar by the way that most would never consider going to if it wasn’t known to be a favorite night spot amongst athletes. The bar may be overcrowded and smell terrible, but the athletes have a tab there, so, not surprisingly, many girls follow) and wait for the girls to flock to him. While most athletes need to be at least semi-good- looking to get girls, the celebrity status of some college athletes negates this general rule. As celebrity status increases, the importance of your looks decreases. 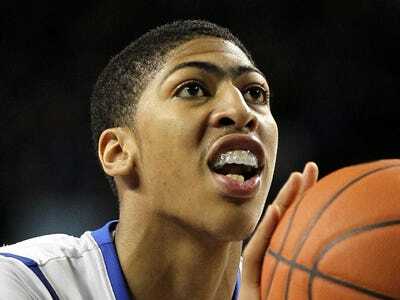 This theory would be irrefutably proven valid if it was found that Anthony Davis ever had a girl friend in college. So far we’ve focused on two superficial reasons why girls go after athletes: popularity and celebrity status. By adding money to popularity and celebrity status, professional sports give us the powerful trifecta of superficial reasons why girls go after athletes. Professional athletes can barely get off their team bus without being attacked by women who mostly have at least one of those three motives in mind. You may not believe this after reading this article, but there are a lot of women who pursue athletes with only honorable and sincere intentions. Successful athletes are often confident, self-assured and good leaders, which are all attractive qualities. Also, many girls find it attractive so see guys excel in something the guy is passionate about, sports or not. The simple conclusion here is that playing sports are a great way to make you more attractive to girls. After all, I heard those Little League World Series kids get swarmed at the middle school cafeteria.